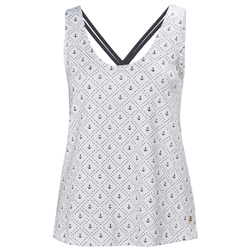 A quick-dry, lightweight, loose fitting women's tank top with strap details on the back. A semi technical, yet flattering women's top in a mix of quick-dry stretch material back and burnout striped front panel fabric. Slightly more relaxed fit for ease of movement and comfort. Small HH metal logo plate at bottom hem.